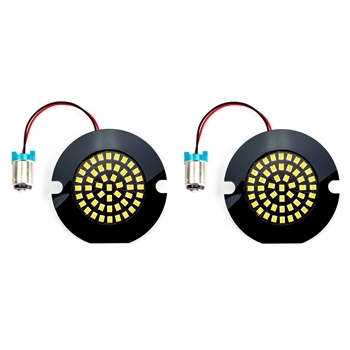 CyronMotor AC11 LED inserts for Yamaha motorcycles with flat round housings. It fits most models pre 2014 such a Vstar and Roadstar. If your lens looks like the one in the photo, it fits! The white halo can only be used in the front turn signals. Amber color 1156 available for rear. Red color is also available for rears, should you decide to get a new look. Need clear lens to for white halo front, and red rears, if you so choose to not use amber rears. Unlike other lights in the market that have narrow angles of light using old technology LEDs, AC11 series use 120 degrees ultra wide viewing angle SMD LEDs. Offering such a wide viewing angle makes this turn signal visible from adjacent road lanes, where it counts the most. When turning or changing lanes normally vehicles and pedestrians in 30 or 45 degrees off axis are most important to be alerted. More than 3 times more effective light in such angles makes AC11 series a clear winner. For a White Halo + Amber version please search for SKU "AC1157Y1AAW"
3x Brighter Under 45 Degrees Angle Than Competition! Copyright © CYRON Motor Inc. All Rights Reserved.